v8monza.com - The Performance GM H-Body Center! The Performance GM H-Body Center! Visitor Mileage is since March 21, 2000. Having Trouble Locating Some Information? - Try Our Internal Search Engine! NEW Replacement Factory V8 Motor Mounts! See our new replacement factory V8 motor mounts and order them from our catalog! Upgrade to 5-Lug Suspension with our Balljoint Adapter Kit! See our installation guide and get more information on application and ordering! Click here for our FREE H-BODY SCREENSAVERS !!! Special thanks to these folks below for the fantastic support they've given! Dolores and David; Mike Gomez; Al, Laurie, & Kyle Howe; Bobby Johnson; Ken Mahoy; Erik Askjem; and many more. The H-Body cars include Chevrolet Vega, Monza 2+2, Spyder, and Mirage, Oldsmobile Starfire, Firenza, Buick Skyhawk, Roadhawk, and Nighthawk, Pontiac Sunbird, Astre, and Formula. The H-Bodies are all based on the same suspension, have a lot in common and can share a lot of the Chevy V8 Monza and after-market V8 Vega parts. Since the main focus here is V8 equipped cars and performance modifications, I'll cover only performance and V8 related information. If you want to convert any H-Body, you can use any after-market kit made for Vegas or any other H-Body, but they are very expensive. Most kits are advertised to fit the Chevy Vega, so look for those. I myself have used many of these products and have had both exciting and disappointing experiences. For those of you on a budget, some modifications listed here will be prohibitive. As for myself and many other do-it yourselfers, I prefer to install readily available used factory parts (in good condition of course) easily obtained from salvage yards for a fraction of the cost of factory or after-market parts. It does require some modification of the factory parts and some ingenuity, but the money you save allows more money to be spent where it's needed most. These FAQs are compilations of my experiences as well as those of other's with the V8 H-Bodies and Vega. New information comes in daily and keeping up with it is a full time job. If you don't see what you're looking for check back regularly or e-mail me. Many of the modifications described here take into consideration that you have a sophisticated knowledge of automotive mechanics and safety practices. If you don't, seek out a competent mechanic that will perform these modifications for you. Before you use any tool or part, inspect it for serviceability. Equipment failure can result in costly repair, damage to property, and serious injury or death. If I have your attention, good, too many people are seriously hurt or die every year because they didn't exercise caution. As with any V8 swap in a non-V8 car you want to be sure your vehicle can handle the extra weight. Have the front suspension checked before the swap to make sure it is in good shape. The extra weight of a V8 engine can worsen any pre-existing suspension problems and can lead to suspension failure. After the swap have it inspected periodically. Also, read this information the same as any information you find on the internet and make your own decisions about what you read. If you find errors, have any suggestions, personal experiences, or information you think would be useful here, please e-mail me. I make no attempts to mislead you, I only know what worked for me and I won't be liable for any damage to equipment, injury to persons, errors in judgement, or depletion of your finances. Hey, I have to protect myself. 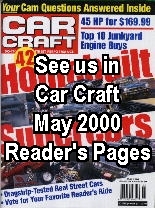 All information and graphics on this site copyright Bob Gumm's "Building the V8 H-Body", 1997. Attention! Some sites have linked to this site incorrectly. If you don't see the navigation frame on the left of this screen, click here and then bookmark it or save it as a favorite. For those using Internet Explorer 4.0, subscribe to it so you can visit even when off-line.